This letter is written in grateful acknowledgement of your generous donation to the Easter Island Statue Preservation Foundation today. 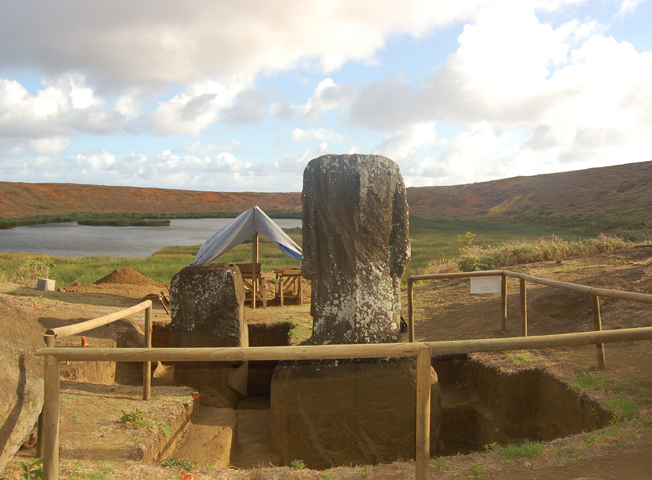 These funds are essential and very welcome as we pursue our goal of archaeological conservation in collaboration with the Easter Island Statue Project (EISP). This contribution has been completed and you will be receiving an email confirmation of your donation from mail@eisp.org. Please continue to follow our project on eisp.org or at Facebook and Twitter as we update our reports and blogs. Thank you very much for your concern for historic preservation, and for becoming a Friend of EISP. Together we can accomplish this monumental task! © Easter Island Statue Project. Follow EISP to keep updated on the latest news! —Adrienne Kaeppler, Curator of Oceanic Ethnology, Smithsonian Institution, Washington, D. C.
¿Qué es Easter Island Statue Project? ¡Atención! ¡Un nuevo descubrimiento fascinante! Rano Raraku Slope, Small Moai "Little Tukuturi"
What is the Easter Island Statue Project? Field Dispatches 2002-2003: Three New Moai Discovered! UCLA Newsroom - "Archaeologist digs deep to reveal Easter Island torsos"